The tribute was interwoven throughout the two days and at a dinner celebration. 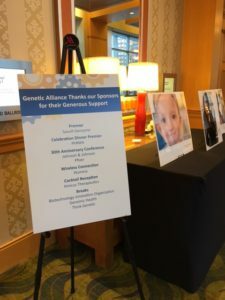 We were able to toast to Genetic Alliance’s many accomplishments under the leadership of three women: Joan Weiss (1986 – 1996), Mary Davidson (1996 – 2004), and Sharon Terry (2004 to present). 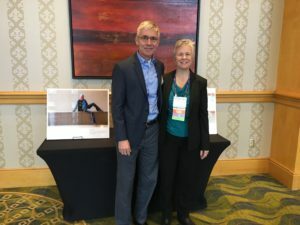 At the dinner celebration, National Institute of Health (NIH) Director and genetics legend Francis Collins shared his thoughts about the important work that the Alliance has done and the big challenges still ahead. Some of the challenges are being addressed through advances in science. Advanced in gene editing, for example, has made it possible that there could be a cure for sickle cell disease in five years. All of the challenges, however, rely on the strong sense of empathy and caring that the people of Genetic Alliance so clearly demonstrate. Mr. Collins summed up his feelings by singing a couple of folk songs which the audience helped out on. He changed the lyrics so that the songs became a tribute to Genetic Alliance. You can view a recording of his songs below. Each of the 150 of us selected a topic area that interested us and broke up into one of four “workstreams” per topic. Working with a facilitator, each workstream group brainstormed problems in their topic area and then planned a project to address them; including goals, outcomes and metrics. Let me just say, there was a lot of brain power in the room so it was a brilliant idea to put this group to work. Amazingly, at least to me, each workstream group came up with a project plan that can be put to work addressing major problems facing healthcare. Equally amazing is that the “un-conference” solicited volunteers to work on these project throughout the year. I am sure that some of these projects will turn out to be the seeds for much bigger endeavors. So here’s to Genetic Alliance. May your next 30 years be filled with empathy, caring and a better life for all. 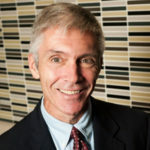 About Len Barker – Len brings corporate leadership and operational discipline to ThinkGenetic. He spent 15 years in the Navy and commercial nuclear industry before founding and growing a series of IT companies that focused on custom application development, education and advanced search technologies. He holds an Electrical Engineering degree from the United States Naval Academy, an MBA from Auburn University and is a licensed professional engineer.